My youngest sister insist that I reveal that my family has a ‘weakness for stuffness’. When we were kids, my sisters and I had stuffed animals. We never cared for dolls, as they don’t seem to be cute nor warm nor hug-gable. We invented stories about the lives of these stuffed animals and their interaction with us kids. You will then think we are weird, because as adults we still do. It’s embarrassing but that’s the truth. I wonder how many adults out there are just like me and my sisters. We have an ever growing collections of stuffed animals. What’s worse about this is, after so many years of marriage and frowns on our silliness, Mr. Wonderful now is beginning to get infected by the ‘weakness for stuffness’. And here’s the reason why: For Valentine’s Day, I gave Mr. 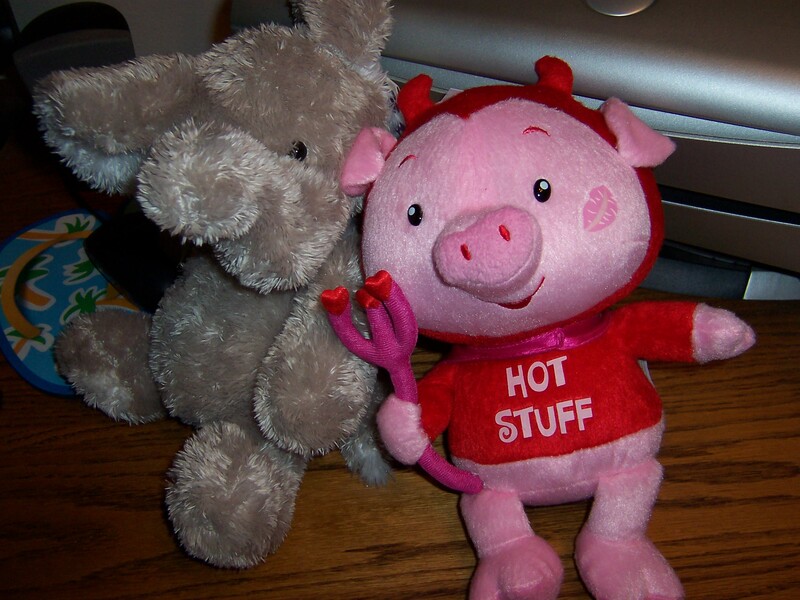 Wonderful a ‘singing’ stuffed pig, and he gave me a stuffed elephant. I was utterly surprised! I loved the elephant. When he saw what I gave him, played the music by pressing the pig’s belly, he actually said he liked it.